Granby Elementary students are joined by veterans during a school-wide celebration in honor of Veterans Day. 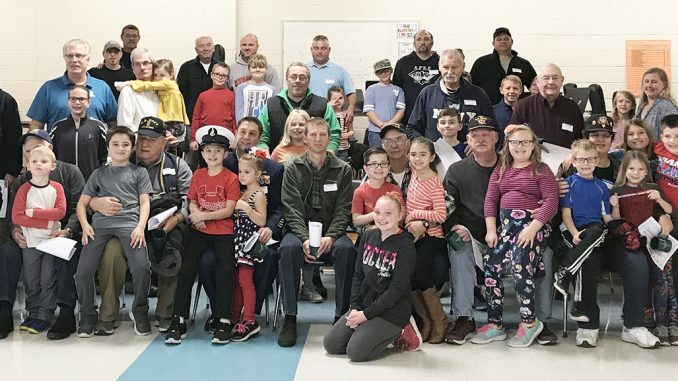 GRANBY – Students at Granby Elementary School recently celebrated veterans because of the sacrifices they have made for their country. During a recent school assembly, select Granby students invited their own special veteran guests to be recognized for their service and accomplishments. Students discussed the importance of freedoms, read Veterans Day poems and some gave their veteran guests a big hug. Honored were: Thomas Anderson, by Jakobie Vescio; Robbie Brand, by Chelsie/Kayden Brand; David Briggs, by Peyton Sharlow; Kenneth Brown, by Fayth Brown; Chris Caza, by Dilyn Caza; David Champlin, by Kyleigh Sheldon; Michael Compson, by Alexa DeForest; Paul Dorsey, by Granby students and staff members’ Rob Kring, by Briella and Jayden Kring; Joshua Nelson, by Aiden Nelson; LeRoy Orso, by Verenity Cleveland; Cathy Ouderkirk, by Sterling Foster; Bruce Phelps, by Vivian Marshall; and Gary Pierce, by Peyton Sharlow. Also recognized were: Colin Pike, by Lucas Pike; Richard Pike, by Kevin Seabury’ James Pisano, by Taylor Pisano; Thomas Putman, by Abigail/Mason Kinney; Peter Russell, by Vivian Marshall; Michael Silkworth, by Rylee/Brycen Spaulding; Thomas Stoutenger, Jr., by Kaydence Reed’ Garry Visconti, by Caleb Coffey; Fred White, by Alex White; and Charles Zawisza, by Stella Tyrrell.